Darth Vader Adult Comfy Throw 73% Price Drop - HURRY SELLING OUT! Darth Vader Adult Comfy Throw 73% Price Drop – HURRY SELLING OUT! 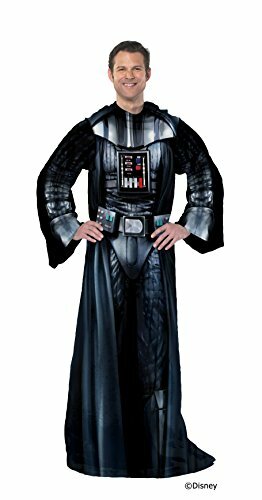 Lucas Star Wars, Being Darth Vader Adult Comfy Throw Blanket with Sleeves, 48" x 71"
Suit up as Darth Vader in this Star Wars adult comfy throw by the Northwest company. Decorated with your favorite sci-fi character, this Blanket with sleeves is not only colorful and vibrant; but also soft and warm. Made of soft, luxurious fleece with oversized loose fitting sleeves, the comfy throw lets your upper body remain protected from the cold while leaving arms and hands free to use a laptop, TV remote, read a book, Eat a snack, enjoy an outdoor sports event and much more. Measures 48-Inch by 71-Inch and is machine washable. Made of 100% polyester.